Rep. Debbie Wasserman Schultz (D., Fla.) told the Washington Free Beacon Wednesday evening that she will not be apologizing to Washington Examiner reporter Philip Klein after she falsely accused him of "deliberately misquoting" her. "No, I definitely will not" offer Klein an apology, Wasserman Schultz said with a slight laugh as she was exiting an event meant to honor Center For American Progress founder John Podesta. Klein caught Wasserman Schultz in a lie yesterday after she falsely claimed that Israeli Ambassador Michael Oren had chastised Republicans as being "dangerous" for Israel. Oren later denied that he had made those remarks, leading Wasserman Schultz to accuse Klein of fabricating her quotes. "Unfortunately, that comment was reported by a conservative newspaper–not surprising that they would deliberately misquote me," Wasserman Schultz said, during an interview with Fox News Tuesday. 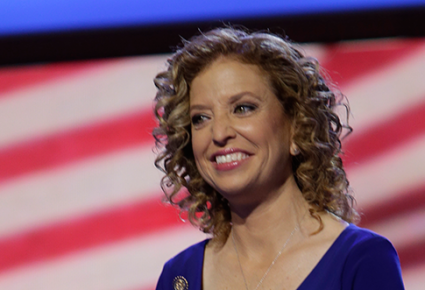 In response, Klein released the audio of Wasserman Schultz’s original remarks at the event, confirming that the Democratic National Committee leader had indeed mislead an audience about Oren’s sentiments. Klein told the Free Beacon earlier today that he does not expect Wasserman Schultz to apologize. "If I could hold my breath long enough to wait for a Debbie Wasserman Schultz apology then I’d probably try to enter myself in the Guinness Book of World Records," Klein told the Free Beacon Wednesday morning during an interview at the Democratic National Convention in Charlotte, N.C..